Every business owner knows it’s necessary to focus on your customers, product, and revenue to ensure success. Sometimes, it’s also important to take a step back and look at information from a different perspective. Managing a business that utilizes recurring billing can be overwhelming. As your business scales and your customer base grows, the data you need to pay attention to increases in volume. If you don’t watch it closely enough, you risk losing precious revenue. You can take a proactive approach to maximizing collection assurance and reducing churn, but it requires constant attention on your customer base. Does this mean your billing administrators have to to scrutinize every invoice? Fortunately, no. There are tools you can leverage within your recurring billing platform to get a quick snapshot of where your invoicing stands each day. The calendar widget, for example, can assist the recurring billing process in several ways. A view like the one provided by the Fusebill calendar tool has become as useful to billing administrators as Monthly Recurring Revenue (MRR) reporting is to the CEO. A billing administrator’s first question on a Monday morning, for instance, is likely going to be, “Did everything run over the weekend?” With one look at the calendar tool, they can see what ran Saturday, Sunday, and Monday morning. The same holds true for any day of the week while tracking billing cycles that run overnight. Without this, businesses can struggle to know if a billing run was successful. In fact, billing issues are often handled reactively—waiting for people to reach out when they don’t receive an invoice on time. But how many customers can you reasonably expect to take the time to do that—if they even realize when they were supposed to be billed? Would you notice right away if Netflix didn’t charge your credit card on time? The onus is not on the customer; it is on the business to confirm that billing cycles are completed properly. Even simply being able to measure the collection ratio will improve your numbers. A billing administrator does not focus on what works; their function is to deal with what doesn’t. Twenty-five successfully completed payments means only that they don’t have to follow up with those customers for that billing cycle, which frees them up to handle unsuccessful payments. Collection assurance is enhanced when failed and successful payments are monitored. In a traditional sales model, a one-time purchase essentially guarantees the payment. Consider a trip to your local home improvement store: you gather everything you need for your next DIY project and go to the register, only to find that your credit card is declined. Is the store going to let you take your purchases home, assuming you will come back later to pay? No. You’ll have to offer a payment method which works before you are allowed to walk out of the store with your items. Collection assurance doesn’t exist for traditional purchasing like it does in e-commerce or subscription-based businesses. Unlike with a traditional one time sale, there’s an ongoing relationship throughout the customer lifecycle in the case of recurring billing. A high-level, calendar view monitoring failed payment activity provides billing administrators with the information they need to zero in on payment failures quickly and easily. By clicking ‘failed payments’ on any day, a billing administrator is able to immediately determine which customer or customers had failed payments. In fact, the breakdown chart not only provides the customer name, but it also differentiates if the failed payment is an initial failure, or if the credit card was retried and failed again. With this knowledge, a business knows if the system is actively taking other dunning related steps, such as contacting the customer directly for an alternative payment method, particularly if retried attempts failed. Not only does the calendar view give immediate feedback on failed payments, it also shows draft invoices which didn’t get posted, triggering follow ups to ensure the invoices are sent. Customer profiles, particularly usage-based ones, vary depending on their size, location, and complexity of charges. Often, larger customers are set up to not auto-post their invoices without first going through a manual review process. When a administrator runs the recurring billing process, they segregate the customer base into different sizes in order to pay close attention to larger customers. Before these invoices are sent out, they are often reviewed to make sure the information is accurate. Sometimes, unfortunately, the final step of sending the approved invoice doesn’t happen due to human error. As a business scales, more of these larger clients come on board. These additional customers require the same attention to detail. Without a calendar view, a billing administrator would need to manually sift through large volumes of invoices that do not auto-post, increasing the chance of missing some. If those invoices are not seen, they will not be sent, and revenue will start to leak. The recurring billing system is always humming along in the background. As it works, exceptions requiring human attention, such as draft invoices requiring review, slip through the cracks. Humans make mistakes, but businesses can mitigate those issues with tools such as the calendar widget. With this laser-focus view, it is easy for billing teams to keep track of unposted invoices and ensure that all invoices are sent within a timely window and in a professional manner. The result is minimizing customer churn and maximizing recurring revenue. 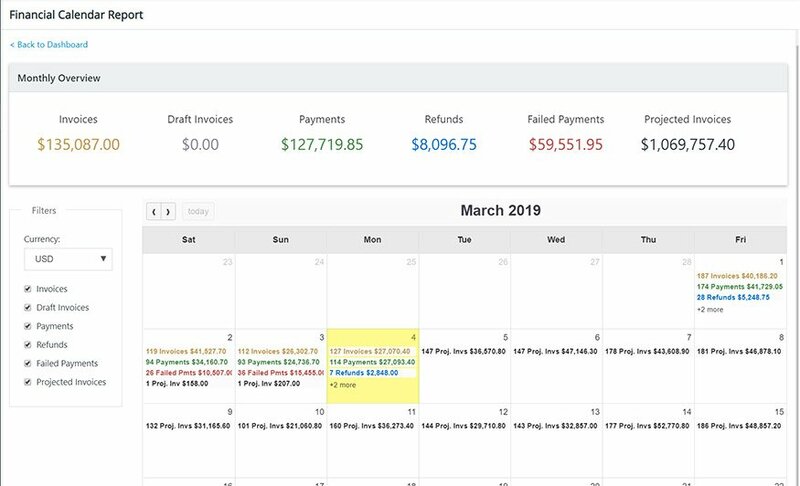 In a complete subscription management and recurring billing platform, like Fusebill, the calendar widget not only looks at past billing cycles, but also to the future. This lets the billing team know in advance if everything is in place for customers from a recurring billing standpoint. Mondays are busy for billing administrators as they review weekend billing cycles, but Fridays are busy, too. Billing administrators review upcoming weekend invoices to avoid encountering multiple failed payments on Monday morning. Because the calendar tool looks into the future, the CEO can also take a peek at projected revenues. Of course, it’s only as accurate as the data set, so there is always going to be variation between what is projected to happen and what does happen. However, for businesses which sell a combination of monthly and annual subscriptions, the calendar provides a view into what is going to happen in future months when annually billed subscriptions come up for renewal. 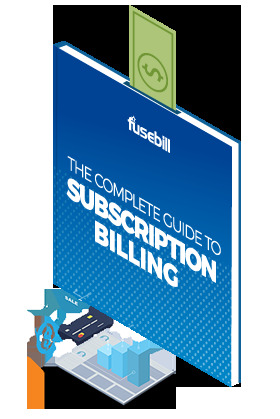 Just as recurring billing businesses are constantly looking to improve their products, Fusebill is consistently doing the same. We have some exciting things in store when it comes to calendar view improvements. We will shortly release a new customizable operator dashboard for clients. That dashboard will make a ‘week in view’ calendar available with a simple click. This tool will be especially powerful for billing administrators and they will be able to skip a step to navigate to the calendar. The new tool will bring the calendar 'week in view' right at their fingertips, with an easy-access view three days into the future and past. Until then, the existing calendar report is ideal for helping to minimize churn, maximize collections, and provide proactive management of the recurring billing relationship.